Introduction to Chainsaw Carving with Burt Fleming. 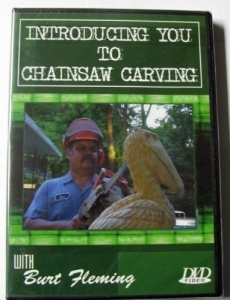 With Burt's help anyone can learn to carve with a chainsaw. Learn the basics from master carver Burt Fleming. In this first DVD Burt walks you step by step through 3 simple projects designed to boost your confidence and teach you the fundamental skills of chainsaw carving. Also included are tips on selecting and maintaining tools, as well as safety.